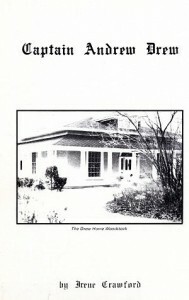 The following publications are available for sale. 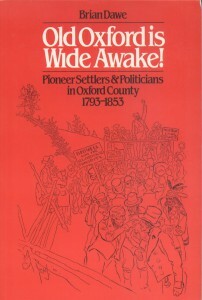 Please contact the Oxford Historical Society to purchase a publication. To celebrate Canada’s 150th Birthday, the Oxford Historical Society and Woodstock Museum, NHS, have co-operated in a project to compile into a book, Quizzical History, a complete series of questions and answers about local history. They were originally published in a weekly quiz contest as articles in Woodstock’s Oxford Review newspaper from late 1999 to early 2003. 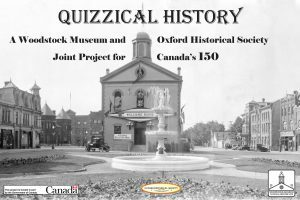 Quizzical History is now in printing, in 8.5 x 11 inch soft-cover format; black and white text and photos; cover in colour; $20 per copy. Chris Packman, member of original Quiz Committee, was responsible for compiling and editing its text; Adam Pollard, Woodstock Museum, found suitable pictures. 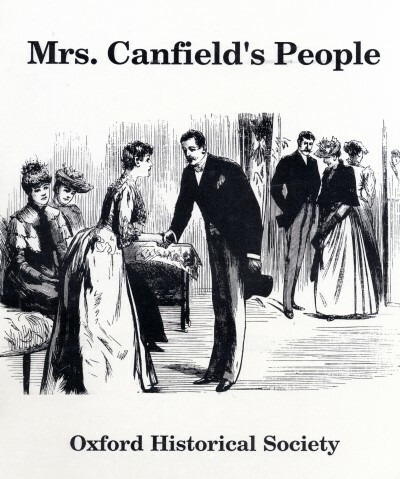 The questions and answers in the book cover a sampling about Oxford County people, places and events from the early 1800s until more recent times. Its contents have been grouped into 16 Topic sections, e.g., Business, Crime and Disasters, Entertainment, Military, Oxford Men and Women, Places, Politics, Recreation & Sports, etc. There is a table of contents at the front of Quizzical History that lists the page start of each Topic; an index at the back that gives a complete listing of all the questions, grouped by Topic. 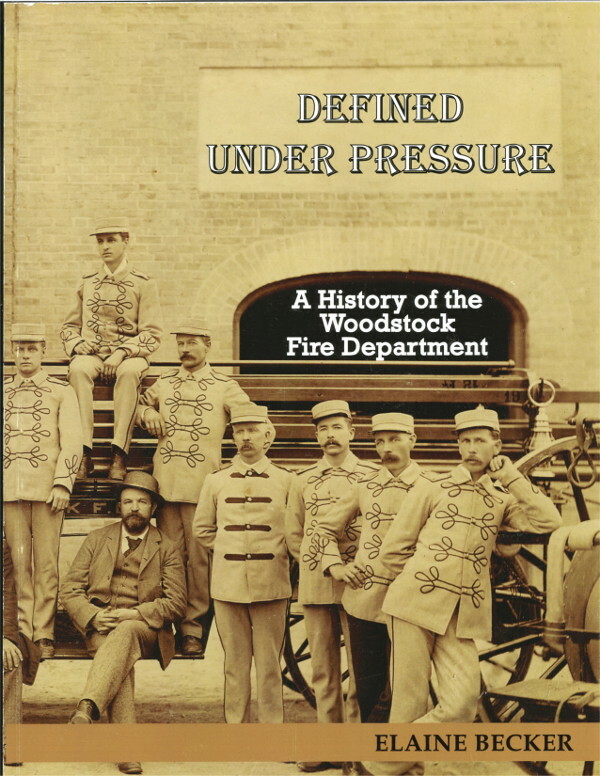 Defined Under Pressure commemorates the 150th Anniversary of the Woodstock Fire Department. 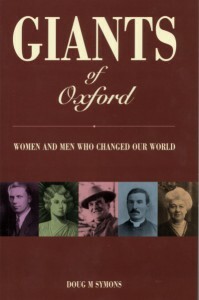 It is available for $15.00 (taxes included), at the Resource Centre of the Oxford Historical Society. 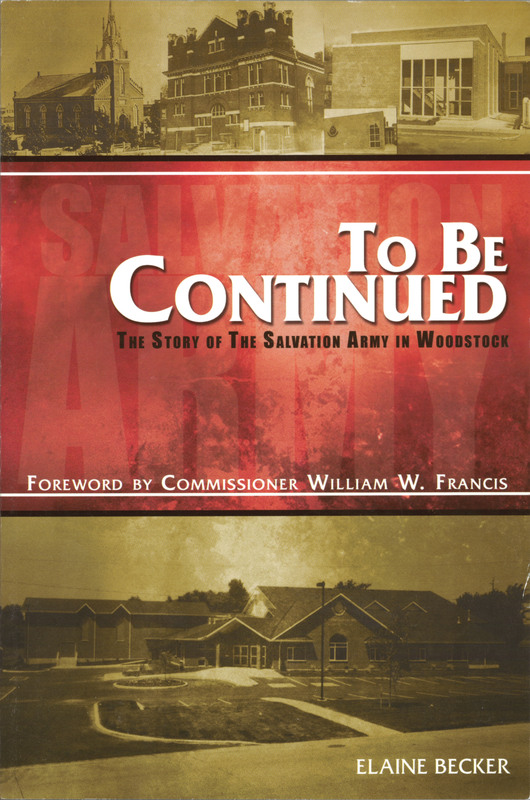 To Be Continued tells the story of the ordinary people who helped to make the Woodstock branch of the Salvation Army what it is today. The Salvation Army, founded in 1865 by William and Catherine Booth, made its way to Canada, in waves of immigrants who came from Great Britain. 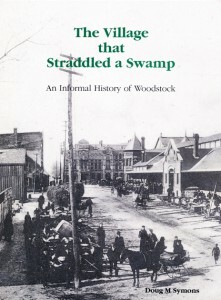 This book gives an overview of the early founding of this organization and its life in Canada. The Woodstock corps was the 17th centre of ministry for the Army in Canada. Born in London, England, in 1792, Drew volunteered for the navy at 14, and took part in naval actions during the Napoleonic wars with France. In 1832 he settled with his wife, Mary, in Woodstock, one of a growing number of British military officers to take up crown land there. In the next few years his family expanded to 5 children. Then came rumours of a rebellion and Drew was involved in defence preparations. After an unsuccessful uprising in 1837, the rebel leader, William Lyon Mackenzie, escaped with others to New York. But Mackenzie made plans to return and that December hired an American boat, Caroline, to ferry arms and supplies to Navy Island, above Niagara Falls. Ordered to take the ship, Drew led a militia group in small boats that captured and burnt the Caroline. Unfortunately, during the raid, an American was killed on Navy Island, in American territory. As Drew was the British officer in charge, many Americans held him responsible for the death and someone put a bounty on his life. After several failed attempts to kill him, Drew fearing for his family returned with them to England in the early 1840s. A fascinating behind-the-scenes look at the stories behind the headlines and the daily operations, problems and solutions of a small-town Ontario police force. It touches on the evolution of crime-fighting methods and the long battle to get a new police station. 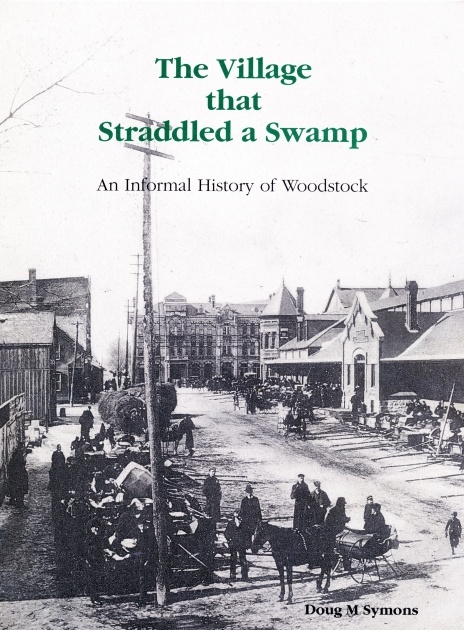 Though Woodstock is a small town sitting in the middle of dairy farm country, it has had its full share of big as well as small-time thieves, murderers, scoundrels, disasters and triumphs. Fortunately, from the community’s start, it has had a police force of local people doing their best to limit disorder, whether from human or natural causes. 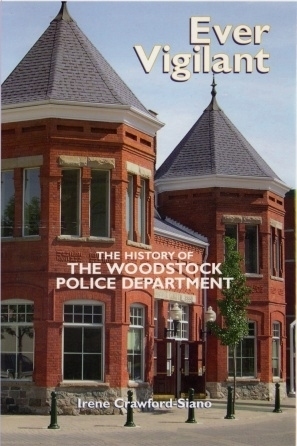 The book takes a sympathetic look at police history from the appointment of the first part-time constable in the late 1820s to the amalgamation of the Woodstock Police Department into the Oxford Community Police Services in 1998. 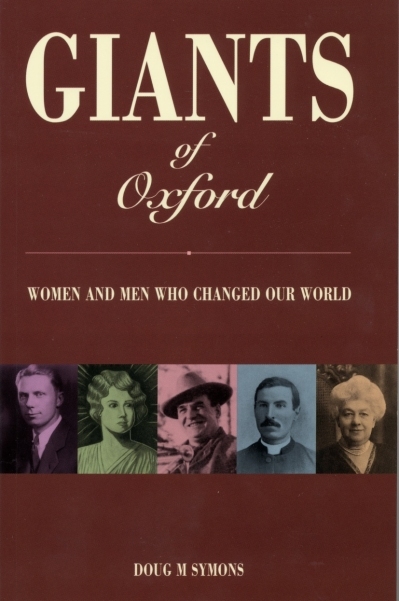 Stories of twenty-nine of the men and women from Oxford County who left their mark. – George Leslie Mackay: trained as a priest, then went to Taiwan as a missionary, medical care-giver. Still revered a century later by the Taiwanese, he is barely known in Canada. An alphabetic listing of people and places of local historic interest plus notes, transcribed by Patricia Moody from a journal kept by Mrs Ethel Canfield during the 1930s. An active member of the Oxford Historical Society, Mrs Canfield was one of its presidents. 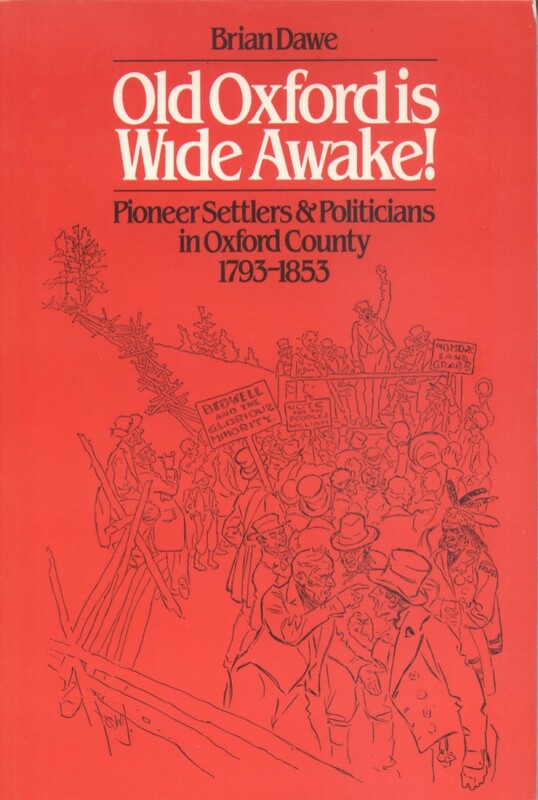 printed by John Deyell Co.
Old Oxford is Wide Awake’ is the story of Oxford County’s first half century of settlement, and its transition from an utter wilderness, criss-crossed by Indian trails, to a properous farming region. It’s also a story of increasing conflict between immigrants from the United States and those from Britain; of Tories and Reformers; of the 1837 Rebellion; and, finally, a compromise and the prospect of more stable times with the coming of the railways. “Something about the Woodstock way of life has let many people develop their … individual talents – in commerce, arts, science, sports, trades, professions, volunteerism, religion, family life, leisure events – building their own lives while making life better for others as well. 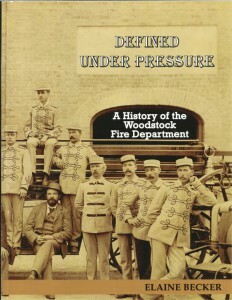 You’ll also read in these pages about quarrels, crimes and natural disasters; Woodstock is no paradise. But overall, what we have in this city I guess is something close to freedom; which builds community”.